In 1072, a medieval scholar named Mahmud Kashgari  from, as his name suggests, the Silk Road outpost of Kashgar  presented a landmark text to the Caliph of Baghdad. It was the first ever compendium of the Turkish language, the babble of tongues spoken by nomadic tribes who roamed between the shores of the Caspian Sea and the wastes of Siberia. Despite the scope of his work, Kashgari was proudest of his hometown, boasting that the Turkic dialect there was the "purest" and "most elegant" of them all. Nearly a millennium later, that language still lingers, spoken by ethnic Uighurs, a Turkic Muslim minority who make up the majority population in the Chinese frontier region of Xinjiang. Kashgar, a city of 3.4 million surrounded by mountains and desert, is at Xinjiang's westernmost tip, closer to Baghdad than to Beijing. And while its history is rich  most agree at least 2,000 years old  many Uighurs in Kashgar see their culture and heritage as under attack by the Chinese government. In the latest move, authorities have started to demolish Kashgar's old town  an atmospheric, mud-brick maze of courtyard homes, winding cobblestone streets plied by donkey carts, and dozens of centuries-old mosques. 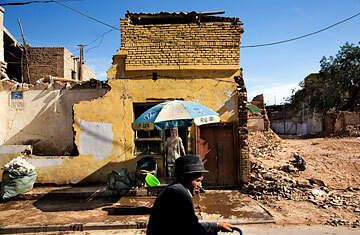 By some accounts, at least 85% of Old Kashgar will be knocked down. Many expect the ancient quarter, considered one of Central Asia's best preserved sites of Islamic architecture, to disappear almost entirely before the end of the year. "This is the Uighurs' Jersualem," says Henryk Szadziewski of the Washington-based Uyghur Human Rights Project. "By destroying it, you rip the soul out of a people." The decision to raze Old Kashgar was made before anti-Chinese riots in Xinjiang's capital of Urumqi broke out earlier this month. That violence, in which at least 197 people died, was largely perpetrated by Uighurs against local Han Chinese, according to Beijing. Uighur-rights groups say that the Uighur death toll after a police crackdown and Chinese counterattacks has gone unreported and that the riots were an outgrowth of long-standing frustrations with Beijing's policies, which, they say, discriminate against Uighurs, depriving them of jobs in their own land while curbing the teaching of the Uighurs' language and their ability to freely practice Islam. According to observers, the bulldozing of Old Kashgar has only accelerated in the riots' aftermath. The old town's warrens and alleyways are home to a tightly knit Uighur community and present, in Beijing's eyes, a potential haven for antistate activities. "Uighurs may see the area as a space of refuge," says Szadziewski. "Moving them out makes the situation much easier for China to control." As many as 220,000 residents (almost half the urban center's population) will be relocated to "modern" housing estates almost 8 km from their original homes, which have been passed down within families over generations. The project has been reportedly executed with little to no consultation with those to be displaced. A sliver of Old Kashgar will remain as a sanitized tourist site, with a staff of actors enacting traditional Uighur culture. The Chinese government has justified its actions by saying the relocation will improve residents' quality of life and that the old quarter was vulnerable to potential fires and earthquakes  a dubious claim considering how long many of Old Kashgar's structures have survived. Most conspicuously, Old Kashgar was not included on a list of Silk Road sites that Beijing recently submitted to UNESCO for World Heritage Status, though it is still a top tourist draw in the region. Suggestions voiced in the international press by a few Chinese city planners to reinforce and refurbish the buildings of the old town  rather than reducing them to rubble  have gone unnoticed in Beijing. A coalition of international heritage organizations is petitioning UNESCO to intervene, but it's questionable how much the U.N. agency can do to circumvent China's development policies. The mood in Kashgar, according to observers, is one of defeat and resignation. Since the violence in Urumqi, foreign reporters in the area have been tightly controlled by government minders and often prevented from taking pictures. Locals fear speaking out; a recent government propaganda campaign sternly warned against those "creating a negative impression." The demolition of the city's historic core fits lockstep with what many consider a concerted effort on Beijing's part to bring Xinjiang firmly under its grasp and dilute Uighur identity. More and more Han Chinese migrants are flooding into Xinjiang's cities, including Kashgar. It's a process that led Turkish Prime Minister Recep Erdogan to controversially brand China's policy a "kind of genocide." In Turkey  now the home of the scholar Kashgari's original manuscript  the Uighurs' plight strikes an emotional chord. And for most outsiders, dusty, remote Kashgar still holds a powerful romantic mystique. Enduring beside billowing sands and beneath glacial peaks, it has charmed and thrilled travelers from Marco Polo to the modern backpacker clutching a Lonely Planet guide. Its knife smiths and livestock bazaars drip with exoticism, exuding a living history at the edge of the world. But as Chinese authorities begin to smash Kashgar's ancient heart, its fabled allure may end up as just that  a fable.